We checked out of our hotel a day early. Here is the (hilarious) exchange the front desk guy and I had as I shared our early departure news. “Isn’t that the truth?” Kyle responded. “Yes, it is true. 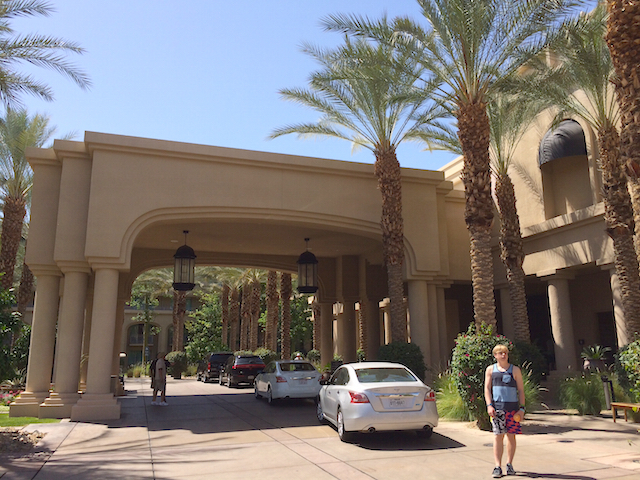 We are overwhelmed with the Indian Wells Hyatt Club so we decided to hit the road.” I said. “I think you should own it.” Kyle suggested. Before the whole front-desk-guy-snack-exchange Kyle and I spent time roaming the resort. In thirty minutes time we found the villas, Kyle pointed out a lovely grapefruit tree, we roamed onto a dirt path and somehow landed on a path that paralleled the “active” golf course. We were on the path for maybe three minutes, when golf security raced over to us (I did not know the high speed golf cart racing to us was actually being driven by golf security at the time, by the way). He hopped out of his cart, and concerned he said, “You guys stay behind me.” He paused. 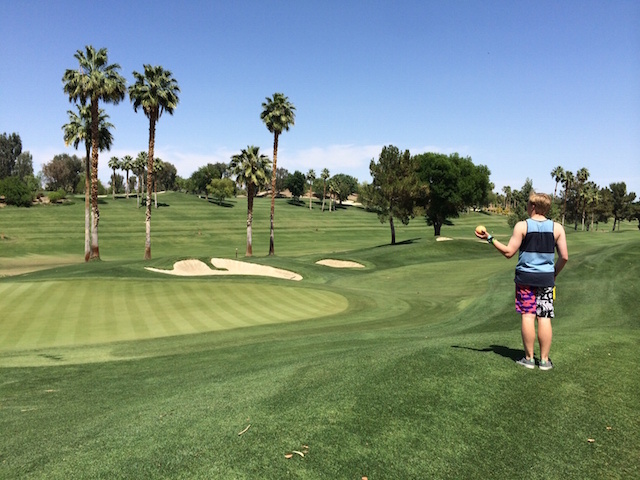 Looked around, and continued, “Wait until that women hits her ball. Then it will be safe. Those things are dangerous.” We avoided the balls and waited until it was safe. Then we walked back up through trees while admiring the lovely desert landscape, and rounded our way back to the front of the hotel. In minutes, we made our way back up to the Club Room. We double checked. We wanted to make sure the snacks were lame before we made our decision. It only took one look to know. Yes, the snacks were lame. Sure, if all we wanted was bottled water, juice, tea, coffee, and cans of soda (or is it pop), we would be set. There was also a small nut assortment. They called it the make-your-own-trail-mix area. Regarding the make-your-own-trail-mix area? Where were the chocolate chips and M&M’s hiding? And at the very least, where was the dried fruit? Craisin? Come on. Along with the trail mix, if memory serves me correctly, there were also tiny apples, some nice cookies, and that is about it. Truth is, it wasn’t just about the mid-day snacks. We had specifically selected this resort because we get free access to the club room, where food is served ’round the clock. Keeping hungry teenagers fed is expensive when on the road, so a good club room can be a great money-saver. That’s why we paid a little extra to stay at a nicer hotel like this particular Hyatt. We’ve stayed at some hotels where the club serves a seemingly never-ending cavalcade of culinary delights. This hotel was not one of those places. After checking in, we stopped by the club for their evening snacks. It was a dish of cobbler and cookies. The breakfast that morning was nice looking, but limited, with a tray of soggy breakfast sandwiches and a strange array of cheeses and lunchmeats. a big disappointment after the great breakfast buffet at the Hyatt in Anaheim. So not being impressed with the mid-day snack started a conversation about how we really had exhausted everything that particular hotel had to offer, and we were ready to move on. As I grabbed a bottle of water, I fantasized about that one time we tagged along on Dave’s business trip to a conference at the Hyatt Regency in Maui, and consequently one of the work perks was the Hyatt Club Room. Let me tell just say, if you want a good club room, a club room that gives you proper snacks, I suggest Hyatt Regency Maui. No. I have not been asked to review these hotels. If you notice I am putting one Hyatt against the other. “Kyle, I have no idea, but they sure make a lot of money.” I responded. And of course our conversation led to a protracted discussion about hotel stays, and giving opinions on hotel stays. Ultimately and obviously we both agreed that we should leave the golf resort reviews to someone who actually golfs. We packed up, and were on our way. After the quickest trip through Joshua Tree National Park, we made our way to Vegas. 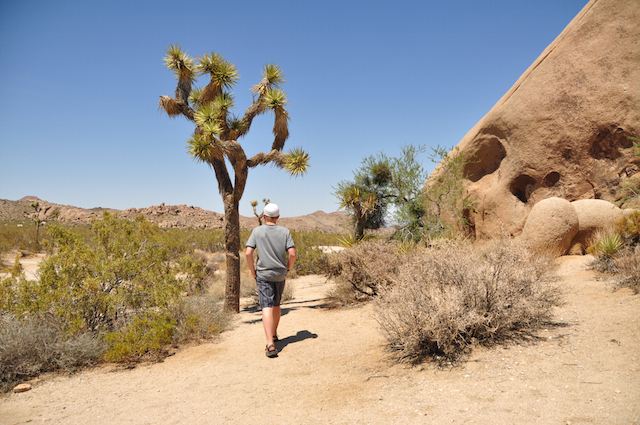 I think I may have even seen a Joshua Tree. I am still not sure. Between the stress of losing two pairs of shoes, our hours of shared hunger, singing out loud for a very long time, and the setting sun, Joshua Tree could have been anywhere really. Thankfully, we have been there before. And even though it was like eight billion degrees the last time we were there, at least we saw many Joshua Trees and Cholla cacti. I also took many pictures, pictures I will use now so I can simply pretend I saw the same flora and fauna today. Now here in Vegas I sit. We are nestled in our hotel, and planning on being here for the next two nights. It is an MGM Brand Hotel (The Vdara), and again our lengthy-hotel-stay-high-status is serving us well. We received a lovely room upgrade accompanied by an awesome Vegas views. The boys think they are in heaven and I am glad to go to bed. Goal today write complete. Good Night! It is 2:36 AM. Sidebar: Hyatt is a partner with MGM Brand hotels. MGM brand hotels will status match with Hyatt and also give you Hyatt points for your stay. Make sure to sign up for both Hyatt’s and MGM’s (M Life) reward’s programs. Sidebar: You might have to live at the Hyatt like we did to earn Diamond status, but the Hyatt Credit Card gets you Platinum status and 2 free nights at any Hyatt. The United Mileage Plus Club Card also gives you Hyatt Platinum. Unfortunately, Hyatt Platinum is pretty weak. No free breakfast, and the “preferred” room upgrades on offer will not get you the kinds of upgrades they’ve been giving us since we earned Diamond. Sidebar: Late in the evening and off-season can be some of the best times to see the beauty of the national parks without the crowds. If you like national parks, you should seriously consider an annual pass for $80, which will get you into most federal fee areas. Then do yourself a favor and try to visit as many of them as you can in a year. The October 1, 2013 United States Government Shut Down is Freaking Me Out.